I read this book on Kindle. Though it’s hard for me to read without a pencil in my hand I made it through just fine. I like reading this older dispensational premillennialist especially when it comes to prophetic things. Sure, I find some minor points with which I disagree, but I miss the plain speaking style of writing that characterized that generation. This book is an overview of the doctrine of the kingdom in a logical and Biblical order. The main thrust of the book is much needed today, and that is that the kingdom of God is (largely) a future reality that will be literally fulfilled on this earth by the actual presence of Jesus Christ on David’s throne in the land of Israel. A minor point I don’t take myself is that the kingdom of heaven parables picture a present age form of the kingdom, i.e., in this age the kingdom is present in a spiritual but absent form until Jesus returns and begins the literal kingdom program. But this view is taken by many and doesn’t do any harm to the future literal establishment of Christ’s coming kingdom. 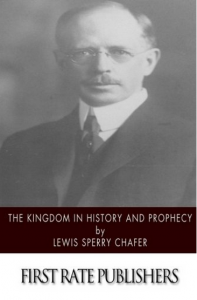 Chafer will continue to be a favorite target of anti-dispensational writers along with Darby and Scofield, but so be it, God give us more such men in this generation!